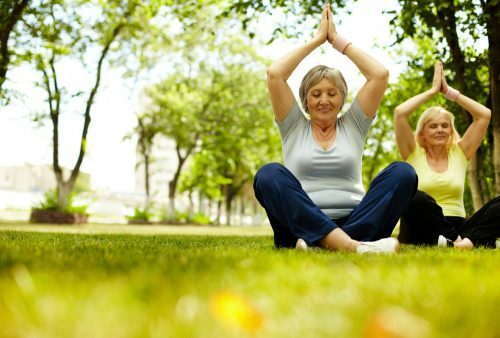 Menopause comes with various woes, and while hormone replacement therapy is one way to deal with the symptoms, doctors now recommend yoga for menopause. Menopause is a phase of life that women go through during which they become infertile and stop menstruating. Changing hormone levels in menopausal women often lead to symptoms such as weight gain, hot flushes, night sweats, mood fluctuations, difficulty focusing, problems sleeping, and cognitive changes such as difficulty learning and forgetfulness. Menopause may also increase the risk of complications such as cardiovascular disease, osteoporosis, urinary incontinence, and in some cases, breast cancer. In order to minimize these risks, doctors recommend exercising and eating a balanced diet rich in fiber, unsaturated fats, and omega-3 rich foods such as fish. Lately, yoga has been a prescribed to manage the symptoms. Yoga is a way of life, sometimes described as a discipline that helps people achieve a balanced mind and body. While it originated in ancient India, it is now popular worldwide as a way of maintaining physical fitness. However, it does more than that. Yoga poses combine strength and resistance exercises as well as stretches that can help improve flexibility and physical body strength. They can also maintain healthy joints and prevent a backache. This improves overall health. Since yoga involves breathing exercises and meditation in addition to physical poses, it can help reduce stress and anxiety. In addition, some yoga poses can improve mental health. A calm and healthy mind can help menopausal women cope with the symptoms. Yoga is not necessarily difficult although it may appear to be. Poses range from simple to complex and can be adapted to suit an individual. You can use blocks, towels, and pillows to support the body if you aren’t flexible or strong enough to do the poses independently. Since they are not high impact exercises, the risk of injury is low. In addition, there are no unwanted side effects. Overall, those who practice yoga have less stress, a positive attitude, and are generally healthier. However, there are some poses that specifically help menopausal women. These poses focus on reducing tension in the body. Supta Virasana, or the Reclining Hero Pose, relaxes the body and helps to open up the chest region. It involves leaning back with the quads stretched out and arms by the side. Those with back problems can use a pillow for support. It helps to reduce menopause-related fatigue and irritability. Setu Bandha Sarvangasana or the Bridge Pose helps to elongate and stretch the spine while strengthening the back. It helps to reduce stress, fatigue, and deal with sleep-related problems including insomnia. Supta Baddha Konasana, also called the Reclining Bound Angle Pose, is a supported backbend. It not only relieves exhaustion but also improves breathing and circulation. Uttanasana is a Standing Forward Bend that stretches the hip and hamstring muscles. It helps to build flexibility and strength. Adho Mukha Svanasana is also called the Downward Facing Dog. The pose appears like an inverted V and involves standing on all fours without going on the knees. It gives a good stretch to the back and legs, and provide relief to many symptoms of menopause as well as headaches. Viparita Karani is a simple pose where you lie facing upwards and put your legs on a wall for support. If done for around 10 minutes, the pose can improve circulation and rejuvenate you. Paschimottanasana is also described as a Seated Forward Bend, as one tries to touch the toes while sitting with legs stretched straight. It helps to improve flexibility. Balasana, also called the Child’s Pose, is a resting pose in which the person sits with the body curled up and faces the floor. It helps improve calmness while giving the back and legs a mild stretch. Poses that build strength and flexibility include Uttanasana, Adho Mukha Svanasana, and Paschimottanasana. Poses that relax and reduce fatigue include the Supta Virasana, Setu Bandha Sarvangasana, Supta Baddha Konasana, and Balasana. The best yoga poses for menopause symptoms include Balasana, which reduces hot flushes; Adho Mukha Svanasana, which tackles menopausal headaches; and Supta Virasana, which counters irritability and menopause-related fatigue.